My blog is set up so that whenever anyone makes a comment it goes directly to my email account. I really like this set up because it’s easier to keep a conversation going through email than through the comment section of a post. It also keeps you from filling up your comment section with a bunch of unrelated comments. Personally, I like to respond to each and every comment that is made on my blog, facebook or twitter. 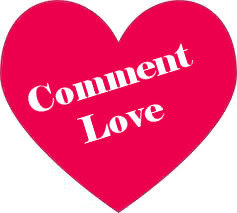 I figure if someone is taking the time to show me some “comment love” then I should take some time to show them some love back. Unfortunately, I can’t always respond to the comments and this makes me very sad. It’s not because I don’t want to, it’s because the comment comes up as a noreply-comment@blogger.com so I can’t reply. In a perfect world no one would appear as a noreply-comment@blogger.com and everyone’s email would be available. However, we don’t live in a perfect world. However, there is a solution! If you’re one of those people who leaves comments on blogs and are feeling unloved because you never hear back from them, you might want to check to see if you are a noreply-commenter. I did a post a few months ago called “Are you a no-reply blogger?“. It’s an easy to follow tutorial that shows you how to check your status and how to fix it. So, if you’ve left some comment love on my blog and you haven’t heard back from me, please know that I wanted to send some love back, it’s just that I couldn’t. Hi Robin. I agree with you and love to comment too. I have to say, you always leave the sweetest comments! Comments are always great. I finally went with Disqus recently, due to many Blogger issues with replying to comments. Have a great rest of your weekend.